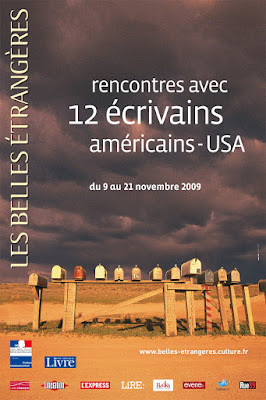 For the next two weeks, I’ll be touring France with 11 other American authors as part of the Centre National du Livre’s annual Belles Etrangères festival. A film crew came to my house over the summer and shot a bunch of footage for an hour-long documentary which will be screened in Paris on Monday night. It will be posted on line later and I’ll post the link here. We’re based in Paris and do various short trips with one other artist where we’ll be doing readings and talking to the public at libraries and schools. I’ll be in Nancy on my own, in the Pyrenées with novelist John Haskell and finally in Corsica with would-be U.S. Secretary of Postracial Affairs, Colson Whitehead. You can see the full itinerary here. And I guess you could call this burying the lead: I’ve been invited to be a guest of honor at one of Oulipo‘s legendary monthly dinners. I’m a bit more excited than I am intimidated! in re Oulipo dinner: Awesome. I hope you'll report back on that.